Improvements in mobile DR systems have made X-raying patients easier than ever. Convenient workflow and the ability to accommodate the ebbs and flows of productivity demands are top of mind for today's imaging departments when considering mobile DR X-ray systems; the capability to accommodate a variety of bedside imaging exams as well as a broad range of patients—from neonatal studies all the way to bariatric imaging—is vital. "Sites are interested in smaller footprint systems but do not want to compromise the number of features or degree of performance typically needed with this type of technology, [considering] how heavily it is relied upon in any type of hospital or medical facility," says Edward Thieman, vice president of business operations for Virtual Imaging, Inc, a Canon company. A system design without the distraction of a tall X-ray tube column blocking the technologist's line of sight while driving and maneuvering the machine has become the gold standard in the industry today. Nearly all mobile X-ray system manufacturers offer a unit that includes this key technical attribute. Chiranjiv Singh, chief marketing officer of GE Healthcare's X-ray division, says customers expect to take their mobile DR systems to every part of the hospital, from the emergency department to the neonatal ICU. "A mobile DR is being seen not just as a radiology device but also as a point-of-care decision support device," Singh says. "This has implications on how the device is connected and what specific tools are designed to support the various care areas where the device is used." This also brings up the topic of reliability, not only from an industrial design or hardware perspective but also from a software and connectivity perspective, Singh explains. "Image quality, system reliability, and connectivity are key themes we hear from customers," he says. Robert Fabrizio, director of strategic marketing for DR and women's health at Fujifilm Medical Systems USA, Inc, says, for radiology facilities, an optimized workflow is the result of smaller and lightweight detectors along with compact and maneuverable portable digital X-ray systems. Advancements in software, battery life, charging, and even antibacterial coating have enabled manufacturers to dramatically improve workflow and performance to meet the most challenging mobile demands in imaging. "The entire continuum of care has evolved from a 'one-size-fits-all' to a personalized approach for each patient," Fabrizio says. "With this shift, mobile DR now affords new capabilities in dose management which make imaging patients at the bedside more comparable in image quality to imaging in a radiology room." Travis Murray, an X-ray product manager at Siemens Healthineers North America, says hospital environments are becoming more complex every day, and the need for flexibility is increasing. Siemens offers the Mobilett Mira Max, designed for everyday use as well as clinical situations where rapid image availability and high image quality are vital. "You can bring this system anywhere in the hospital that you need to," Murray says. "Rather than having to take a patient down to the radiology department, you can just put the system anywhere in the hospital." Jerry Ellquist, diagnostic imaging team lead with Longs Peak Hospital in Longmont, Colorado, has been using the Mobilett Mira Max and notes that it simplifies the department's DR workflow by being able to wirelessly access patient orders, including information clinicians need to correctly identify patients, instantly assess the quality and positioning of the image, and, once the image quality standards are met, wirelessly send the image to the image archive system. "The image is also instantly available to doctors and other care providers, who love to be able to immediately assess patient condition or other factors, including line placement or even for verification of sponge count in an active surgery case," Ellquist says. "[Also, the] trauma doctor is able to ask for specific X-rays on the spot and to make critical assessments very quickly. The results are easily attached to associated orders and sent for the radiologist to review and report. This same concept applies to X-rays on the floor for line or tube placement." To address workflow and productivity demands, Thieman says Virtual Imaging's Enhanced Workflow feature allows users to access PACS, RIS, hospital information systems, and other related systems onboard the RadPRO Mobile 40kW FLEX PLUS Digital X-Ray System without requiring a visit to a nearby dedicated workstation in order to complete studies and send exam information to the radiologist for interpretation. Speaking to the need for robust wireless digital detectors, Canon's latest generation of CXDI wireless detectors, the CXDI-710C, CXDI-810C, and CXDI-410C Wireless Digital Radiography systems, are composed of carbon fiber, include embedded handles for ease in positioning and carrying, and are light and liquid resistant. Virtual Imaging uses Canon CXDI detectors in both its tethered and wireless versions. As of RSNA 2017, the company's RadPRO Mobile 40kW FLEX PLUS Digital X-Ray System offers new system features that provide wireless detector battery charging and LED status indicator lighting. "The capacity to charge wireless digital detectors by way of the panel or detector battery itself are priorities for end users, along with the need for long-lasting mobile system batteries that will allow for prolonged use of the system during highly productive periods where it is not feasible to stop and charge the system's battery for any amount of time," Thieman says. "[Also], the heart of a digital mobile X-ray system is the digital detector itself. Today's market is demanding more lightweight, water resistant, and technologically advanced digital detectors that are also durable in this type of challenging imaging environment. "The recently introduced LED status light indicator assists the technologist in confirming the status of the system while multitasking at the bedside," he adds. "This indicator permits greater awareness of when the actual exposure is taking place, as an additional means of warning to the user and other clinicians also working in the same area." At GE, the company has been incorporating customer feedback into its mobile DR solutions. That's led to the launch of its latest product, the Optima XR240amx. "It combines the power of our latest Helix advanced image processing with high-resolution, 100-micron FlashPad HD digital detectors to enable our customers to see fine details with outstanding contrast," Singh says. Another feature is QuickConnect, an adaptive wireless technology that enables automatic channel switching to improve image transfer and avoid wireless interference with other equipment on the hospital's network. "This is extremely critical to avoid dead zones, in terms of wireless connectivity in the hospital and to ensure that the digital detector wireless signal does not interfere with the rest of your surgical equipment when you take the mobile DR into an operating room," Singh says. "The initial generations of digital mobile X-ray systems encountered frequent, workflow-interruptive drops in wireless connectivity," Thieman says. 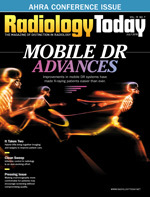 "Advances in wireless communication have improved this aspect of mobile DR system technology and, specific to this functionality, the RadPRO Mobile 40kW FLEX PLUS Digital X-Ray System is outfitted with [our] wireless Distributed Antenna System, which assists in maintaining connectivity of up to 40% over single-access point systems." Fujifilm has recently redesigned its mobile DR system, the FDR Go, for a more proficient mobile exam experience. The FDR Go PLUS was unveiled at RSNA 2017 and will begin shipping this quarter. "The most noticeable upgrade is a retractable telescopic column with one of the lowest park positions on a full-size portable, to provide optimal visibility while traveling throughout the medical facility," Fabrizio says. George Curley, director of marketing communications for medical imaging in the Americas at Agfa US Corp, says improving workflow and expanding applications and utilization are important, as customers need accessories and software that can help them with special applications such as stitching—specifically full spine—in the operating room and improving image quality with large and bariatric patients. "We are offering stitching capability and MUSICA 3+ image processing software optimized for the spine and bariatric patients for our mobile DR," Curley says. "These options are also available for DR Retrofit and DR rooms with our new MUSICA Acquisition Workstation launching in July." Digital mobile X-ray systems are commonly deployed to ICUs or medical floors within a hospital to image a patient's chest or abdominal anatomy for tube and line placement verification after a physician or clinician has inserted the line or catheter, typically for medicine administration or nourishment purposes. "Given the advanced image processing functionality of today's systems to more accurately highlight tubes and lines along with the instant image preview at the patient's bedside to allow verification of placement or the need for repositioning, more timely and accurate efforts are achieved for the benefit of the patient," Thieman says. Mobile DR brings valuable imaging benefits to patients through the full range of departments: emergency, operating rooms, ICUs, patient wards, and, of course, general X-ray. Fabrizio says another department that has increasingly sought out mobile DR is pediatrics. The FDR Go PLUS is compact, moves quietly, and can be brought to patients' bedsides in the neonatal or pediatric ICUs, he says. "In addition, there is also the option for kid-friendly decals," he adds. Singh says premature infants in neonatal ICUs require extra protection and care from the world around them as they grow and heal. He says the Optima XR240amx provides support for carefully controlled neonatal environments, such as the GE Giraffe Carestation incubator. "Its small tube design can easily be positioned above the Giraffe Carestation's canopy, and the detector slides into its base," Singh says. "This allows our customers to image the babies without moving them or adjusting their fragile environment." Agfa offers 20, 32, 40, and 50 kW X-ray generators with its mobile DR systems. A 20 kW or 32 kW system may be all that is needed for pediatric and average-size patients, but many customers prefer the 40 kW or 50 kW generators for the output power needed to image larger patients. As technology has evolved, systems have become increasingly user friendly for technologists. These types of systems are often described as "X-ray rooms on wheels" because they can be used for an extensive range of patient and exam types, compared with past systems. Due to the industry's dependence on mobile X-ray technology, future iterations should continue to provide systems that cater to the end-user technologist, improve performance and efficiency within the workflow, and include features that ensure safety to both the clinician and patient. "As seen with the majority of advanced imaging modalities in recent years, it is optimistic to forecast a type of hybrid imaging technology in this arena of mobile X-ray," Thieman says. The future is extremely exciting, Singh says, adding that it's coming quickly. "As we get more data and the capability to learn more, we will see the adoption of new technologies like AI changing the way mobile DRs get used and, more importantly, the role they will play in patient care," he says. Curley says Agfa's works in progress include an integration of real-time collaborative tools for clinicians, volume imaging applications, tomosynthesis, and AI to further improve physicians' clinical workflow. Just as the consumer electronics industry is making smaller, lighter, and more durable phones, laptops, and tablets each year, manufacturers of DR technology will do the same for detectors and mobile units.